Minor planet 6344 P-L (=2007 RR9) among the stars on October 3, 2007. This is currently still a faint object, recorded in 3-minute exposures tracked on the target object by Paulo Holvorcem of Brazil, remotely using the 0.35-m telescope at Tenagra Observatory in Western Australia (at Shenton Park, near Perth) operated by Paul Luckas. When I was an astronomystudent at Leiden Observatory in the Netherlands, pioneer asteroid huntersIngrid van Houten-Groeneveld and her husband Kees van Houten were about toretire, after very fruitful careers. Their legacy was the discovery of over2000 asteroids, of which some 1800 yielded orbits, in collaboration with Prof.Tom Gehrels of the Lunar and Planetary Laboratory at Tucson, Arizona. In 1960,Gehrels made a sky survey using the large 48-inch Schmidt Telescope at thefamed Palomar Observatory, long before modern asteroid reconnaisances, andshipped the photographic plates to the van Houtens at Leiden Observatory. Theyused a large optical bench, equipped with a binocular and flip mirror, tocompare each set of two large photographic plates and find the faint dots oflight moving among the stars, a technique called blinking. This task is nowroutinely done by fast computers, or by us watching avi movies of asteroids. In the mid-eighties, thisasteroid searching was pooh-poohed by some. Why find more, if you already havethousands? Yet, among all those asteroids, Ingrid and Kees discovered twoobjects in peculiarly elongated orbits, 6344 P-L and 6743 P-L, on plates takenthe very same nights of Sept. 24 - 28, 1960. The original designation of P-Lstands for the Palomar-LeidenAsteroid Survey. Most asteroids move innear-circular orbits in the main asteroid belt between Mars and Jupiter, but6344 P-L and 6743 P-L's elongated orbits bring them occasionally to within 0.05AU from Earth's orbit. These are Potentially Hazardous Asteroids (PHA), we nowknow, of the type that killed off the dinosaurs. When that role of asteroidsbecame established in the late eighties and early nineties, the search forasteroids became suddenly important insurance for our very existence. Only whenan asteroid's orbit is precisely determined can we be certain it will notimpact Earth in the foreseeable future. 6743 P-L,was soon recovered and has since been renamed 5011 Ptah. On the other hand,6344 P-L remained the oldest lost Potentially Hazardous Asteroid out there. Weknew it existed, it had a roughly determined orbit, but we did not know whereto point the telescope. On theafternoon of October 3, 2007, I scanned the list of newly discovered PHA's tosearch for potential parent bodies of our meteor showers. In October of 2003, Ifound that an object called 2003 EH1 moves among the meteoroids of our mostintense annual shower, the Quadrantids, and many other asteroids have beenunmasked as dormant comets since. From our meteor observations, we find thatthese objects appear to erupt on occasion by breaking off significant chunks ofmatter that fall into the small dust we see on Earth as meteor showers somecenturies later. The Quadrantids are suspected to have formed as recently as1490 AD, when Chinese astronomers noticed a comet that moved in the same planeas the meteoroids. In 1819,another such dormant comet breakup resulted in a brief comet called"Blanpain." In 2004, I found a fragment of this breakup, now called 2003WY25, which is still moving among the meteoroids, and responsible for theDecember Phoenicid shower. In collaboration with Finnish astronomer EskoLyytinen, we were able to trace an outburst of Phoenicids in 1956 to this very1819-breakup dust. I am surethat there are many more dormant comets out there that have not yet beenidentified as parent bodies of our meteoroid streams, because many streams movein low inclined orbits and their parent bodies hide among the 896 (andcounting) other known PHA's. In a paper that was just accepted for publicationin Icarus, I have identified 42 such candidate parent bodies, many of whichneed confirmation from better observations of the object and of the associatedmeteor shower. So, I wascontent to find that newly discovered 2007 RR9 was also a possible parent body,now for an obscure shower called the gamma Piscids (#236 of the IAU showerlist), which is active in mid-October and early November. 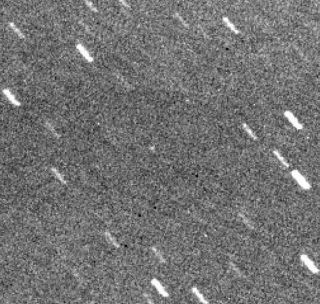 2007 RR9 had beendiscovered by the Catalina Sky Survey four weeks earlier on September 10.Interestingly, I already had identified a possible parent body for this shower,namely 6344 P-L, the long-lost asteroid. When I comparedthe orbits of both objects, I noticed that they were very similar. So much sothat they could well be the same object. I wrote Brian Marsden of the MinorPlanet Center of the Smithsonian Astrophysical Observatory in Cambridge, Massachusetts, the clearing house for such identifications: "If warranted, you canprobably check if this could be the same object." The nextmorning, I learned the good news via an electronic circular (MPEC 2007-T13),issued by the Minor Planet Center on October 4. It was titled "6344 P-L =2007 RR9." Instantly, the orbital accuracy for 6344 P-L improved from lousyto phenomenal, now having been observed for over 47 years, instead of only fourdays. Later that day, 6344 P-L was swiftly removed from the list of asteroidsthat could pose an immediate impact danger. A designation as PotentiallyHazardous Asteroid means that 6344 P-L is a known asteroid bigger than 150m (500 ft) in diameter that comes to within 0.05 astronomical units of Earth?sorbit (roughly 7,480,000 km or 4,650,000 miles). The size is estimated on thebasis of the object?s observed brightness and an assumed reflectance of 13percent. This object may not, infact, be an asteroid. 6344 P-L moves in a 4.70-year orbit nearly all the wayout to the distance of Jupiter. The elongated orbit translates into a Tisserandparameter of T = 2.94 (was originally T ~ 3.05), a measure of the orbitalenergy and angular momentum of the orbit, which defines it dynamically as aJupiter Family Comet (T = 2.0 - 3.0), not an asteroid (T > 3.0). Therefore,in my opinion, this object is a now-dormant comet nucleus. A fragment of abigger object, perhaps, that after breaking up in the not-so-distant past mayhave caused the gamma Piscid stream of meteoroids. If so, it should be verydark, reflecting only 4 percent of light, and therefore be much bigger, about530 m across. If this comet would hit Earth, it would strike at about 1 billiontons of TNT, enough to destroy a small country. Interestingly enough,6344 P-L is coming closer to the Earth as we speak. The object is approachingEarth from behind and will brighten to magnitude +18.5 in mid October, only topass Earth on the inside of our orbit on November 7 at a distance of 28 lunardistances (0.072 AU). On November 17.8, it will arrive at the closest point tothe Sun. Somewhere along thispath, the object could become weakly active and turn from an"asteroid" into an official comet. We have a rare opportunity tofollow this process and see if the heat of the Sun can still nudge some gas anddust off this small planet. All of this made for agreat story, but it even got better. Just over a week later, another one of thevan Houtens' discoveries, 5025 P-L, was recovered by the automated SpacewatchII asteroid survey program. 5052 P-L is a Near Earth Object, coming to within0.2 AU from Earth's orbit, not quite as dangerously close. The news wasannounced on MPEC 2007-T58. Brian Marsden wrote to meabout the circumstances of this recovery on October 11: "An objectreported to us by Spacewatch on Tuesday and placed on the NEO Confirmation Pageand followed up yesterday was found here also to have been observed in NEOsurveys on Sept. 10 and 30. This was good enough to reveal that 5025 P-Lfitted, as well as a Spacewatch single-nighter in 1999. This kind ofthing is what should have happened last month with 2007 RR9 leading to 6344P-L, but you came to the rescue instead." He added: "All thesame, it's a curious coincidence that the two old P-L NEOs should be recognizedjust over a week apart." Indeed, after 6344 P-L,this was the remaining P-L object waiting recovery. I also knew it, because5025 P-L was linked in the past tentatively to the Taurid shower. Its initialorbit was based on only three nights of observations and was extremelyuncertain. The original solution had it move far beyond Jupiter. Now, with T =2.988, it falls among a whole group of other similar potential dormant comets,reaching to just inside the perihelion distance of Jupiter. Whether or not someof our Taurids originate from this object can now be investigated. Brian further wrote:"The oldest lost NEO is now 1972 RB. Actually, with a 49-day arc theorbit is quite good. It's just that there hasn't been a chance to look at itsince discovery. It comes to a distance of 0.1 AU in 2013 and should then bemag 16-17 or so." In honor of the work bythe van Houtens and Gehrels,the objects 6344 P-L and 5025 P-L will keep their designations, waiting to benumbered and receive an official name. Now the orbits of these objects areprecisely determined, we can be certain that they will not impact Earth in theforeseeable future. Dr.Peter Jenniskens is author of "Meteor Showers and their ParentComets," published by Cambridge University Press in 2006, which providesmany more background stories on other potential parent bodies and our meteorshowers.